When an individual seeks admission under the Visa Waiver Program (VWP), he or she forfeits the right to seek any form of relief for removal except for asylum. However, an applicant for admission under the VWP or a VWP entrant who is removable (e.g., as an overstay) is only eligible to be placed in asylum-only proceedings before an immigration judge, and the applicant may not file an affirmative asylum application with the Department of Homeland Security (DHS). However, VWP entrants are generally permitted to file an affirmative application for asylum if (1) they were admitted under the VWP, and (2) they apply within the 90-day period of stay and are not otherwise removable. In this article, we will examine issues involving the VWP and applications for asylum. The statute authorizing the VWP makes a single reference to asylum at section 217(b)(2). There, the statute makes clear that, in order to qualify for admission under the VWP, the alien must waive any basis to contest any action for removal other than on the basis of an application for asylum. The INA states definitively that an alien applying for admission under the VWP or an alien who has been admitted under the VWP may not contest removal on any basis except by filing an application for asylum. In the following sub-sections, we will examine how the statute is interpreted through agency regulations and guidance. 8 C.F.R. 217.4 addresses inadmissibility for VWP applicants and deportability for aliens admitted under the VWP. Under 8 C.F.R. 217.4(a), an alien who presents him or herself for admission under the VWP will be removed if it is determined that he or she is inadmissible. In general, the alien will be summarily removed without a hearing before an immigration judge. However, if the alien applies for asylum after being refused admission under the VWP, alien will be issued a Form I-863, Notice of Referral to Immigration Judge. After the issuance of the Form I-863, the alien has an opportunity to present his or her claim for asylum to an immigration judge in accord with 8 C.F.R. 208.2(c)(1) and (2). 8 C.F.R. 217.4(b) contains rules for an alien who is admitted under the VWP and then found to be deportable under section 237 of the INA. Similar to applicants for admission under the VWP, an VWP entrant who is found to be deportable will generally be removed without a referral to an immigration judge for a determination of deportability. However, if the deportable VWP entrant applies for asylum, he or she will be issued a Form I-863 for referral to an immigration judge in accord with 8 C.F.R. 208.2(c)(1) and (2). Please note that 8 C.F.R. 217.4(b) covers aliens who overstay their 90-day period of admission under the VWP. Before addressing asylum proceedings before an immigration judge, it is important to understand the restriction on asylum applications imposed by 8 C.F.R. 217.4(a) and (b). Normally, an alien is permitted to apply for asylum with the DHS and have his or her application considered there. However, aliens covered by 8 C.F.R. 217.4(a) and (b) may only have their asylum applications considered by an immigration judge. This is because, rather than adjudicating the application, the DHS will merely refer the issue to an immigration judge. 8 C.F.R. 208.2(c)(1) and (2) contain the rules for asylum proceedings for applicants for admission under the VWP and for aliens admitted under the VWP who are subsequently ordered removed. 8 C.F.R. 208.2(c)(1)(iii) and (iv) address applicants for admission under the VWP and aliens admitted under the VWP and found to be deportable, respectively. The regulation lists both classes of aliens as not entitled to section 240 removal proceedings in which an immigration judge determines whether the alien is removable and, if so, whether he or she is eligible for relief from removal. As we noted with section 217(b)(2) of the INA, an alien seeking admission under the VWP forfeits the right to contest removal on any basis other than an application for asylum. Accordingly, aliens seeking admission under the VWP and aliens ordered removed who were admitted under the VWP are only eligible for what is called an “asylum-only proceeding.” In an asylum-only proceeding, the immigration judge will only consider the alien's applications for asylum and withholding of removal (applications for asylum are automatically considered for withholding of removal and protection under the Convention Against Torture). The alien is not permitted to otherwise contest his or her removability or apply for any other forms of relief from removal. Furthermore, 8 C.F.R. 208.2(c)(1) provides immigration judges with “exclusive jurisdiction” over such asylum applications. It is worth noting that the regulations provide identical rules for aliens admitted under the Guam-Commonwealth of the Northern Mariana Islands (CNMI) Visa Waiver Program, which is provided for in section 212(l) of the INA. The regulations providing for asylum-only proceedings for Guam-CNMI Visa Waiver Program applicants and for those admitted under the Guam-CNMI Visa Waiver Program who subsequently violate their status or overstay are found in 8 C.F.R. 208.2(c)(1)(vii) and (viii), respectively. The program-specific regulations on this point are found in 8 C.F.R. 212.1(q)(8). Parallel Executive Office for Immigration Review (EOIR) regulations are found at 8 C.F.R. 1208.2. The INA and the regulations address the disposition of asylum applications by applicants for admission under the VWP and by those who overstay or otherwise violate status after being admitted under the VWP. Notably, both omit those who are admitted under the VWP and maintaining status. The United States Citizenship and Immigration Services (USCIS) addresses asylum applications by those maintaining status after being admitted under the VWP in its Administrative Asylum Procedures Manual (AAPM) (Nov. 2013 update) [PDF version (see page 32-33)]. The Form I-589, Application for Asylum and Withholding of Removal, was filed before the expiration of the 90-day period of authorized stay under the VWP. In short, provided that the alien was lawfully admitted under the VWP, has not overstayed his or her 90-day period of admission, and is not otherwise removable, he or she may file an affirmative asylum application with the USCIS. Importantly, the AAPM makes clear that the USCIS asylum office retains jurisdiction over an asylum application filed by a VWP entrant, as described above, even if his or her 90-day period of admission expires before the asylum office completes processing of the case. The only difference is that for referrals the Form I-863 is issued instead of a Notice to Appear. It is worth noting that the asylum office jurisdiction issues apply the same to those admitted under the Guam Visa Waiver Program. In order for a VWP entrant to have a Form I-589 accepted for processing by USCIS, he or she must establish that he or she was admitted under the VWP. In order to do this, the applicant must present his or her passport or signed I-94W card showing that he or she was admitted. An applicant's credible testimony will usually not be sufficient. These provisions apply to applicants who would only be eligible for a referral by the Form I-863. The Board of Immigration Appeals (BIA) and several courts have held that the VWP provisions apply to individuals who seek admission based on a fraudulent passport. In Matter of Kanagasundram, 22 I&N Dec. 963 (BIA 1999) [PDF version], the Board held that an alien who has been refused admission under the then Visa Waiver Pilot Program must be issued a Form I-863 if he or she is refused admission. The Board held that 8 C.F.R. 217.4 “specifically encompasses individuals who present fraudulent and counterfeit travel documents from such countries.” Id. at 965. In Shabaj v. Holder, 602 F.3d 103 (2d Cir. 2010) [PDF version], the United States Court of Appeals for the Second Circuit held that an alien who is denied admission under the VWP because he or she used a fake passport may only contest removal on the basis of an application for asylum. In Matter of D-M-C-P-, 26 I&N Dec. 644 (BIA 2015) [PDF version], the Board held that immigration judges and the BIA do not have jurisdiction in asylum-only proceedings to consider whether the alien was improperly placed in such proceedings based on a referral under the VWP. However, in Handa v. Clark, 401 F.3d 1129, 1133 (9th Cir. 2005) [PDF version], the United States Court of Appeals for the Ninth Circuit held that an alien could raise claims that the government improperly applied the VWP procedures. In Matter of A-W-, 25 I&N Dec. 45 (BIA 2009) [PDF version], the Board held that an alien admitted under the VWP is not entitled to a bond hearing from an immigration judge. Instead, the immigration judge may only consider the asylum claim. 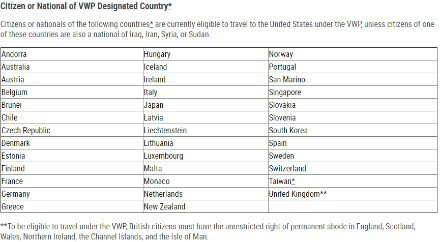 Asylum applications by those seeking admission under the VWP or who have been admitted under the VWP are relatively uncommon. 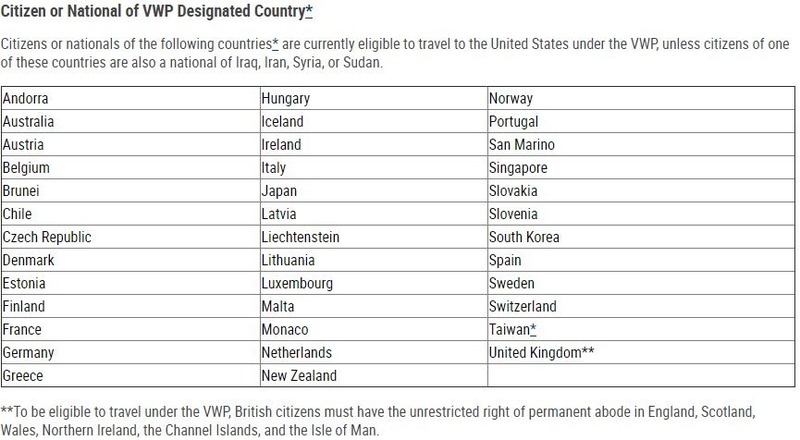 The reason for this lies in the fact that the countries participating in the VWP are not countries from which individuals often seek asylum. Accordingly, it is unsurprising that a large percent of the published court decisions on the issue involve individuals who applied for admission under the VWP using a false passport. If an individual is properly admitted under the VWP and believes that he or she has cause to seek asylum, it is essential for this individual to consult with an experienced immigration attorney immediately. In addition to the fact that an alien seeking asylum should always consult with an attorney, it is important to remember that a VWP entrant cannot affirmatively apply for asylum if he or she is overstays the 90-day period of VWP admission. Applicants under the VWP who are refused admission or those who are determined to be removable (including as overstays) are only eligible to apply for asylum before an immigration judge. As in all cases, such an individual should consult with an experienced immigration attorney for guidance on whether he or she has a bona fide asylum claim and for properly pursuing the claim if so.